Reader Question: One of the things that is the most important to me as I begin the very first stages of planning my own wedding is that I hate the part of a gift requirement of any kind. My family never encouraged Christmas lists when I was growing up, which may be the reason that I shy away from asking for things. In general, if there is something that I need that badly, I buy it myself. My fiance and I are grown-up type people (besides the eating ice cream for breakfast occasionally thing) and while we're definitely low on the income bracket, we are not children who lack in the basic necessities of household management. I mean, our toaster cost $5 at Goodwill, but it's OUR TOASTER, and I felt good about rescuing it, and I'd feel bad to get rid of it while it still works since we have way too much trash filling our landfills as it is. 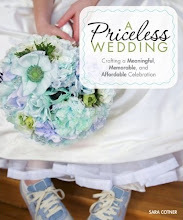 I've been a bridesmaid twice, and while I was happy to help both times, I was (and still am) making less than $20,000 annually and resented spending upwards of $500, twice, on a dress-that-I'll-never-wear again, shoes-that-killed-my-feet, shower gifts, travel, and wedding presents...I want any friends and family present to have a good time and not have to worry about money or playing an uncomfortable role. I had the idea of putting on the invitations (which I'm still trying to figure out how to make both sustainably and inexpensively--getting there!) a line about how gifts are not necessary. My fiance, who is sometimes more practical, is arguing that it might be kinder for us to have a registry of some sort for relatives who wish to get a gift and will ask us what we want. I think the whole thing feels very privileged but I'm willing to bend if I'm being silly and impractical (the worst thing you could ever call me is insensible). I suppose my question is: is the line I want to put on the invitations possible, or is it impossibly rude? Would it be insulting to tell people to make donations in my name to some charity (insulting because it assumes that they would, naturally, be giving me SOMETHING, no offense to anyone who went this route)? Is my fiance right and is this something I should get over, already? Is there a middle ground, like "Gifts are lovely, but not required- we are registered at blahblahblah should you wish to get us one"? I hear you! It was important for Matt and me to ensure that our guests did not feel obligated to give us a gift. Honestly, their willingness to join us for the celebration was the real gift. 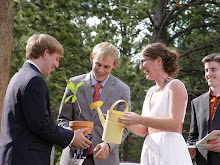 Additionally, so many of our guests had to travel to attend our wedding. Those folks had to shell out hundreds for airline tickets, then money for rental cars (we tried to coordinate carpooling as much as possible), and then for lodging (we tried to provide them with very inexpensive options). We did not want them to also feel obligated to spend $25, $50, or $100 more on gifts. Also, we didn't want a lot of stuff that goes on the traditional wedding registry. We already had plates and glasses and appliances up the wazoo. We already had towels and sheets. Heck, in most cases we actually have two sets of these things! On the practical side, however, I knew that if we didn't set up a registry, people would bombard us with questions like, "Well, what do you want?" We went ahead and set up a registry but filled it with things we actually wanted (of course some people really do want new dishes!). We wanted a subscription to Angie's List (since we were buying a new house), sharp sewing scissors, a hiking backpack for our dog, ReadyMade's blueprint for building a modular dwelling, organic gardening books, etc. We also had a section for people to donate money (since we were trying to pull together all of our money for a down payment on our house). Your presence (pun intended) at our wedding is gift enough. Seriously. We utterly and completely appreciate your willingness to make the trek. If you stubbornly insist that a gift is necessary, you are welcome to view our registry by clicking on the link below. But honestly, your presence is more than enough. We’re not kidding! Of course there are more formal ways to convey a similar sentiment! In the end, many of our friends took us up on our "Get out of gifts free" offer. We were just glad to have them there. However, we still ended up with the gardening books, the dog backpack, the subscription to Angie's List, as well as lots of money from family. 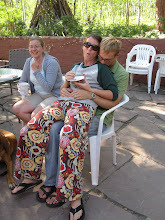 We also had several creative friends who went beyond the registry and got us very creative and personal gifts. Wishing you the best with whatever decision you and your partner make for yourselves! ooo! i just faced this issues! in leiu of putting it on the invite, i have a knot wedding website, so i put on the registry page that gifts were not necessary, their presence was present enough. however, i did register at target and will be registering at bed , bath, and beyond- but only for stuff i NEED. we have double of so much stuff already, it's just not practical to buy a whole lot more. i'm with the reader whole-heartedly. i'm younger, in a lower income bracket, but i pay all my bills and never ask anyone for help, EVER, and the worst thing someone can call me is naive. it grates on my nerves. good luck on the registry! Thanks for this post! I am on the fence with my FI about whether we are going to accept gifts. I am definitely going to setup a registry but we are only going to ask for things we need like new dishes and a set of pots and pans, etc. I will probably put the "blurb" on an insert with the invites and also on our wedding website. My fiance and I had a similar dilemma with the engagement party a close friend is insisting on throwing for us. At the end we decided to ask her to tell people that gifts were not necessary. She looked up the etiquette online and ended up writing "*no gifts, please" on the bottom of the invitations. The party is in a month, and hopefully, there will be no gifts, only close friends, family and fun! * If you are one of our crafty loved ones, we’d love if you considered making us something. * Not so crafty? There’s surely help that will be needed to set up for/clean up from the festivities! You can click here for our JustGive “registry”, which will let you mix-and-match online donations and keeps a tally for us. OK, that ended up long, sorry! Speaking with my mother about this- she indicated that many people now (in our community) just give money. It's more practical as people getting married already tend to have what they need. At the same time- I don't really want people to feel obligated to give money- I like the donation idea, making it anonymous would be even better. I was shocked at the- 50$ at the wedding shower and ANOTHER 50$ at the wedding idea! Come on. Something I've read that is corny but cute and almost the same as yours: "Your presence is presents enough". It was from Offbeat Bride. She continued to make the rest rhyme and it was cute. This is basically the route my fiance and I have chosen. Great topic to tackle, I think lots of brides feel this way. I think registering will be helpful for those traditional guests (who are going to buy you something no matter what you say) to not have to "guess" what you might like. However, I do think a donation is a REALLY wonderful way to allow your guests be able to still contribute something on your wedding day without you feeling awkward in receiving something personally. It's so admirable that you want to use your wedding to do something charitable, I completely support this alternative! Nice wedding blog, it's my first time to drop by your blog, and I find it very interesting. Very informative posts here! Keep up the good work! Traditional, Emily Post-style etiquette says that you should never, ever allude to gifts on your invite. (even if it's to say you don't want them) For those of us who have mothers and grandmothers that care about those sorts of things! Or, you could list a few of your favorite charities. You know, I tend to be against putting anything on the invite (it's not the place for it). You can list your gift preferences or lack there of on a website or by word of mouth, and that works very well. I will say, we recently got a invite to a wedding we can't attend, and the website said NO GIFTS. Like, none, period. While I totally respect where they are coming from, it actually made me feel really sad. We can't make it to the wedding, and giving a gift would have been our way of participating and showing our love. Since they were inflexible on that point (not flexible, like you suggested Sara) it left me feeling sad. We can send them a note, but since they are not really my friends, but my partners, I wouldn't write the note, and hence won't be able to do much to express my joy for them. So, I think that's something to think about. Don't register for things you don't want FOR SURE (no one wants to get you something you don't want or need), but remember that gifts are sometimes more for the giver than the getter. Meg - yeah, I realized that an hour or so ago. I really enjoy reading your site and am planning to imitate (it's flattery, right?) a few of your ideas. I really think honeymoon registries & charity registries are fantastic ideas but I think you should register for a few tangible items that your really want. Even if it's random, handmade stuff - you can put it on myregistry.com. I look at it as a way of honoring your guests. You may not need anything but they may want to buy you something & if they are going to do it anyway, you may as well tell them what you really want. 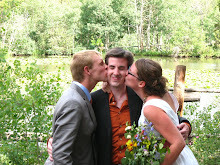 Our wedding was small and intimate (50) so there was less chance of offending so few people who were very dear to us anyway. In the end we just put at the bottom of the invitation in fine print *please, no gifts. * Most people seemed happy to oblige this request, our artisan type friends made us gorgeous and meaningful pieces. In the end it was close family who most wanted to give us tangible and lasting things which is lovely and understandable. My mom let them know we had an artwork on lay-away at a gallery which they could contribute to. Oh and we still got some lovely towels from a great aunt. I understand feeling uncomfortable about -asking for gifts-. After all, many of us have had it drilled into our heads since childhood that it's impolite to ask for gifts. But I think it's equally awkward to require -no gifts-. If your friend showed up at your house one day with a basket of homemade muffins, would you send him/her home with the muffins? They were thinking of you, they wanted to present you with something that showed they care. In the same way, I think that some wedding guests (myself included) -like- to give gifts. We like to offer something pleasing, thoughtful, pretty or useful to those we care about. So I think it is also kind to keep in mind that some people will wish to give a physical gift, and knowing that it is something you want and need will delight them. "First, we should say thank you to those who have already promised to help with the wedding. Your generosity and expertise are deeply appreciated! Ryan and I currently live in two separate apartments, each one equipped with all the stuff we need. So when we move in together, we will already have too much stuff. What I'm saying is, we really don't need anything. Honestly and truly, all we ask of any of you is the pleasure of your company at the wedding (if possible) and your best wishes. However, when we went to register at Bed Bath and Beyond the guy asked us how many people we were inviting to the wedding and then proceeded to tell us that we needed to register for 300 items. Seriously??? 300??? I don't think we even have 300 things in our apartment right now!! We already have about every reasonable house thing that we would need. So we spread the word that we didn't need or really want anything. But still registered as Macy's and REI (an outdoors store!) for a few small items to keep people from asking us over and over again what we wanted even after we told them nothing. This is a very good entry and I'm sure something that bugs a lot of brides-to-be. Excellent food for thought, thank you! We used myregistry.com which allows you to register for items from a variety of stores as well as create your own categories. I registered for favorite recipes from our guests, something homemade and crafty, $ towards our honeymoon and some hobby (board games, camping equipment, etc.) People can choose to go with something free (recipes) or buy us a new camp stove. There's a lot of alternatives. I thought that it would be nice to include photos of us actually using the gifts in our thank you notes. Like a photo of us on our honeymoon or playing Scrabble or making/eating the dessert somebody gave me a recipe for. Seemed more fun than sticking a crystal punch bowl in the back of my cupboard anyways. "We are so fortunate to have the love of each other, our friends and our family, that there is nothing else we could ask for. Therefore...we’re not registered anywhere. All we want is your love and attendance!" Reader+others: Please, please, please don't put on your invitation "No gifts, please!" -- that is super-rude and presumptuous! Several other readers had it right: the place to express your gift preferences is on your wedding website or on shower invitations (though I guess you wouldn't have a wedding shower if you didn't want any gifts, right?). Never, ever put it on (or IN) your wedding invitation -- that is very, very tacky. If you don't give people some help/hints/a list, you will end up with some "special" stuff that you would never, ever pick out on your own. Sometimes it's nice, sometimes it's not. The whole point of a wedding registry is to give your guests a starting point. By no means is it a list of demands! Think of it as a helping-hand for the for people who do want to honor your special day with a gift. Give them some direction as a courtesy, so they don't get frustrated with you in the midst of celebrating your special day! As for the invitations, I had a friend who planned to purchase supplies from Hobby Lobby or Michael's and print her own at home, and also add embellishments like hand-tied ribbon. This would be so easy to do with beautiful store-bought (or homemade!) recycled textured paper and organic string or ribbon! Also, consider sources like thrift stores or rummage sales where you might be able to find items that have already been purchased and might otherwise be thrown away that you can repurpose for your own purposes.